1. Frostweave Blue – DropsQuestsCrafted/Cloth. You’ll have to be level 90 for everything in here, but you could probably find other gloves and boots for this outfit, which would knock down the level requirement to ~70. The left Draenei is what it looks like on a female without boots, pants, shoulders, and eyepatch. I thought it looks appealing for the ERPers. 2. Tweaked Brazen – Mostly Drops/Leather/Level 80. There’s a few lower level items in this set but the majority is 80. They’re mostly gotten from farming Trials of Champions. 3. Crazy Cat Purple – Mostly Quests/Cloth/Level 40. I have a different set of leggings beside the one listed because that one’s Alliance-only and the other is available for both sides. I’m gonna skip the colorful commentary this time around. I know what y’all really want. 1. Back in Black: Quest Rewards/Leather. You’ll have to be level 51 to wear everything. 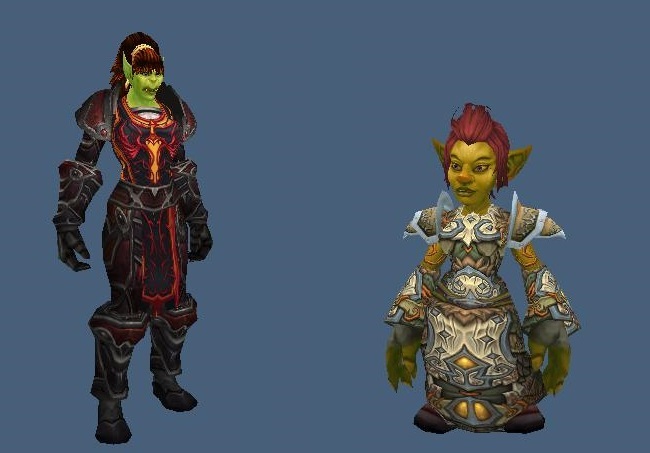 The extra vest in the Wowhead link is the Horde’s version of the tunic. 2. Hallowed Purple: Drops/Cloth/Level 70. I really love this on my Warlock. It’d look good on a Shadow Priest or a cultist too. 3. Ivy Chainmail: Drops/Cloth & Mail. You have to be level 31 for the Cowl, but everything else you can wear around level 20. Just found this nifty little mod. It’s like an in-game model viewer with filters and where to get items from and things. Not much else to it.